Nearly all motorcycles have a drive system comprising of two sprockets: a front sprocket (also known as the counter-shaft or drive sprocket) and a rear sprocket (also known as the driven sprocket). The front sprocket is attached to the engines transmission output shaft with the rear sprocket mounted to the rear wheel. Both sprockets have teeth which slot into the gaps in the motorcycle's drive chain. The sprockets work in tandem with their teeth engaging between the drive chain links. 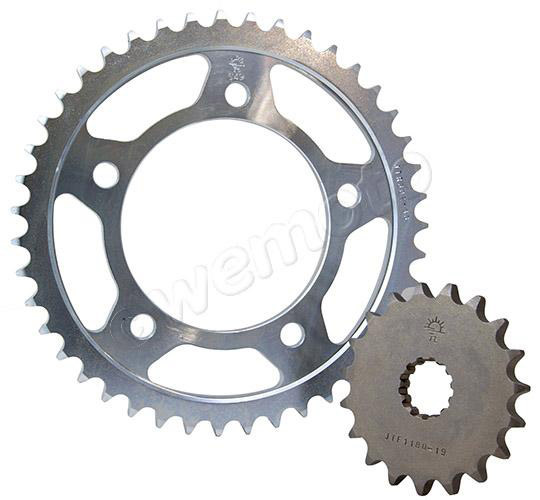 The front sprocket rotates at the same time as the engine's transmission output shaft, and the teeth pull the drive chain, in turn rotating the driven sprocket as it traverses. This system transfers the power from the engine to the rear wheel, moving the motorcycle forward. This pulling force is transmitted via the side plates of the chain through the chain's pins to the rollers. The distance between the centres of the pins is equal to the distance between the centres of the sprocket teeth. This means that the force pulling the chain is equally distributed among the rollers. Sprockets are most commonly made from steel to increase their longevity; aluminium is sometimes chosen for racing on rear sprockets as it is lighter, but it wears more quickly than steel. The front sprocket is typically much smaller and has between 10 and 18 teeth. The rear sprocket, usually the larger of the two, can have between 28 and 64 teeth. For some, highly modified motorcycles, a third sprocket is used to maintain tension though it supplies no additional power to the rear wheel. The ratio of the difference in size between the front and rear sprocket can determine some aspects of the motorcycle's performance. Check our guide to Sprocket Gear Ratios for more information. A typical chain link is compromised of an inner plate, outer plate, pin, bushing and roller. These links can be sealed by using an O-ring or X-ring. 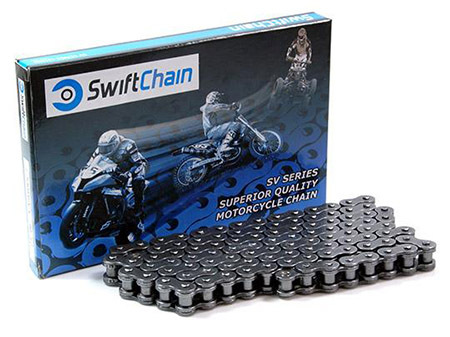 While non-sealed chains are relatively friction free, they have no internal lubrication and tend to wear a little quicker. O-ring or X-ring chains have a sealing ring, usually rubber, which is placed between the inner and outer chain plates. These seals work to keep internal lubrication in and keep dirt out. For more information about chains and chain dimensions see our Chain Dimensions page. Why do my chain and sprocket need changing? As the chain flexes from straight to curved around the sprockets and back again, the chain's pins rotate slightly inside the bushing. This tension wears away some of the metal of the pin and bushing, causing the chain to effectively elongate. The chain passes over the sprockets several thousand times a minute, slowly wearing away its teeth. If the teeth on a sprocket have become sharpened or 'hooked' at the tip instead of being blunted, they need to be replaced. You can tell if your chain is worn by pushing up on the chain in the middle with one hand while pulling on it at the rear sprocket. If you can pull the chain out from the sprocket by about 1/4 inch or more, the chain is worn. Alternatively, you can tell by measuring your chain and seeing how it compares to its length when new. It will need replacing if it has lengthened by 2.5% or more. 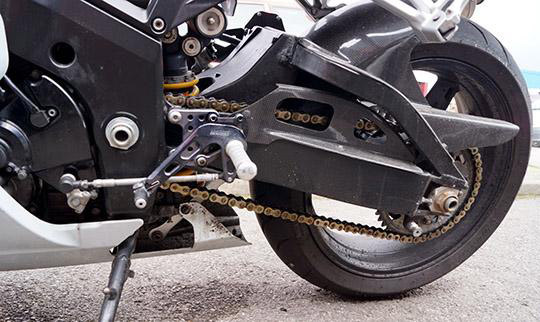 If a chain is too loose or has tight links it can snap teeth off of the sprockets causing the chain to snap which can be extremely dangerous. Be aware not to over-tighten your chain as this can cause damage to the bearing on the output shaft. Checking both your sprockets and chain regularly for wear is highly recommended. Why change the chain and sprocket at the same time? It is highly recommended that you change both your sprockets and chain at the same time. A new chain and sprockets work so well together because they have a matching pitch (the distance between each pin on a chain and the centre of each tooth on a sprocket) . As they wear, they wear together. The pitch on a new chain will not match the pitch of worn sprockets, causing the new chain to work less effectively and wear more quickly, as it adapts to match the pitch of the worn sprockets. 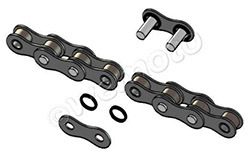 Replacing both chain and sprockets as a set greatly prolongs the life of both products.